A New Dog Pet... Finally! Dog lovers rejoice! 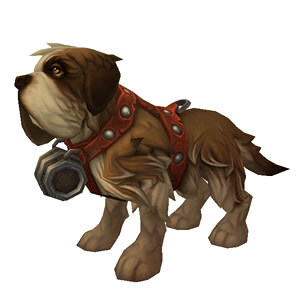 One of the datamined pets is a new canine companion named Bernard. As its name suggests, it's a Saint Bernard, and it is equipped with lifesaving booze "medicine." The item that teaches this pet is Bind on Pick Up, but how players will obtain it is currently unknown. This information will likely become available in the near future so stay tuned. Another pet found in the latest datamining of the PTR is one that was recently announced to be the pet for Blizzcon 2013, Murkalot! Collecting this battle-ready baby murloc will award the achievement Murkalot. Patch 5.4.1 may not be too far away, since Blizzcon attendees (and Virtual Ticket holders) will be receiving their own baby murlocs at the start of the convention (November 8th). We'll have to wait and see!